Learn the basic rules for playing tennis and get ready to grab a racket and hit the court! The object of the game is to hit the ball over the net so that it bounces in the opponent's court in such as way that the opponent can't return it over the net. 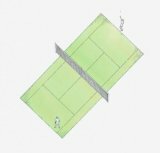 The court is rectangular in shape and can have a variety of surfaces: clay, grass, asphalt, porous concrete or other material. A 3½ ft-high net splits the court in half. Wonder what a regulation-size tennis court looks like? See the official tennis court dimensions. You need a tennis court with a net, a tennis racket for each player, and a tennis ball. It works best to play with at least 3 balls so you don't have to chase a ball after every miss. In the men's game, a tennis match is over when one of the players wins 3 out of 5 sets. For women, the match concludes when someone wins 2 out of 3 sets. Singles tennis is played with 2 players who line up on opposite sides of the net. One starts out as the Server while the other is the Receiver. A coin toss determines who serves first and which side of the net each player will start on. The winner of the toss may choose her preference of service or side. "Love – 15 – 30 – 40 - Game". Game: A player must win by 2 points to win the game. If both players have earned 3 points, the score is 40-40 which is called "Deuce." The player who wins the next point has "advantage." If the player with "advantage" wins the next point, she wins the game. If she loses the next point, the game goes back to Deuce. Play continues in this fashion until someone wins 2 points in a row to gain a 2-point lead. When saying the score, the Server's score is always given first. For example, a score of "40 - 15" means the Server has 3 points, and the Receiver has 1 point. If the players are tied at 5 games each, they must play until a player wins 2 games in a row to gain a 2-game lead. Match: For men, a player has to win 3 out of 5 sets to win the match. For women, winning 2 out of 3 sets is required to win the match. fails to return the ball over the net before it touches the ground twice on her side of the net. returns the ball so that it hits out of bounds on the opponent's side of the court. hits the ball into the net. is hit by the ball anywhere other than on her racket. touches the net with her racket or any part of her body. touches the ground on her opponent's side of the net. throws her racket to hit the ball. 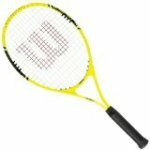 it bounces inside the court after crossing the net. the ball touches the net or crosses outside the center posts as long as it lands in the correct court. a player's racket reaches over the net after hitting the ball as long as the player did not hit the ball before it crossed the net. the ball lands on a boundary line. To serve, the ball is thrown into the air and struck with the racket before it hits the ground. The ball has to cross the net without bouncing and land in the service court (diagonally opposite from the Server.) If the ball lands on a line, it's a good serve. If the first serve is not good, the Server gets a second serve. If that serve fails to go over properly, the Server loses a point. If the serve hits the net and falls into the appropriate court on the opponent's side, a "let" is called, and the Server serves the ball again. There's no limit to the number of lets that a Server can have. The Server continues serving in the same court until he either makes a good serve or gets 2 faults. the server swings at the ball and misses it while attempting to serve. the ball doesn't land in the proper service court. the ball touches any permanent fixture other than the net. After the first fault, the Server shall serve again from behind the same half of the court. After the second fault, the Server loses a point, and he moves to the other side for his next serve. The Receiver may stand wherever he wants to on his side of the net, but the ball must hit the ground on the serve before he may return it. At the end of each game, the Receiver becomes the Server and the Server becomes the Receiver. They continue to alternate like this after every game until the match is completed. Players change sides at the end of the first and third games and every other game after that until the set ends. At the end of a set, players only change sides if the total number of games in the set is an odd number. If the number is even, they wait to change sides until after the first game of the new set. Sometimes tennis can be frustrating for young people and those just learning how to play the game. See some great ideas to modify the basic rules for playing tennis to help beginners. Reduce the size of the court by playing side-to-side on one half. Great for anyone who physically has trouble covering the entire court or lacks the skills to keep from chasing the ball all over the place. 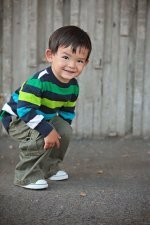 Training tennis balls are awesome for players with limited mobility and skills. They are specially designed to move 50% slower than regular balls, and their bright colors make them easier to track. The USTA has some fun ideas to introduce kids to the sport. 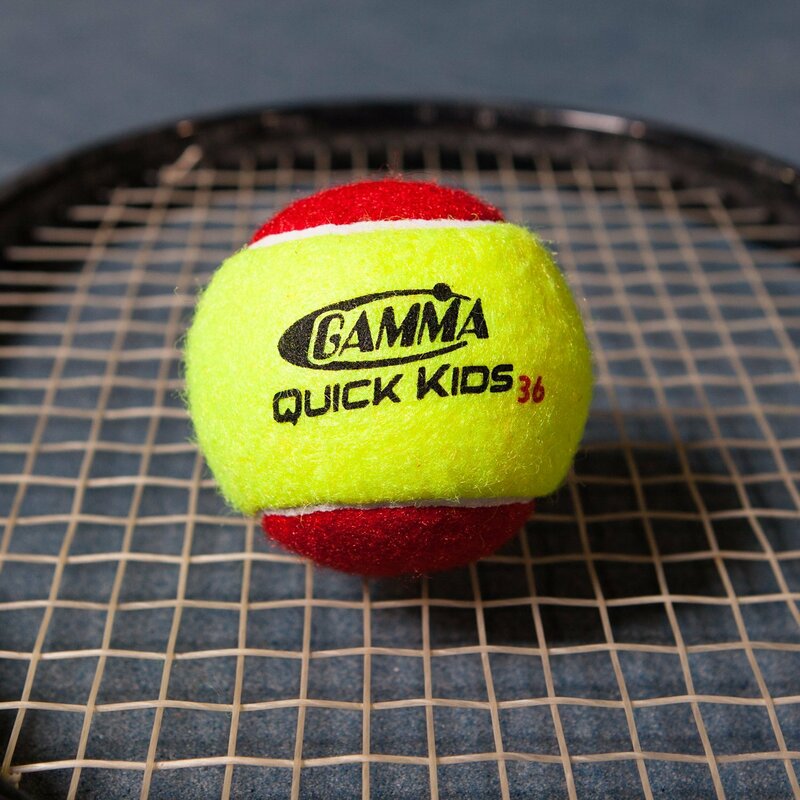 Check out their youth tennis programs that use slower-moving balls and smaller tennis court dimensions.